What is the high priestess, then or now? Mystic, sorceress, servant of gods and the community. The title high priestess is meaningless among organized religions, furthermore christianity, Judaism and Islam attach derogatory context to the term. However, the Mesopotamian high priestess held secular and spiritual sovereignty equal to the Dalai Lama. Enheduanna was the daughter of Sargon, the emperor who unified southern Mesopotamia. She was a high priestess of Nanna the moon God, ruler of time. Her tradition sustained for 500 years and Mesopotamian monarchs ascended their daughters to hold the post High Priestess of Nanna at Ur. From the time of Moses until that of the later prophet Samuel, the holy anointing oil was used by the shamanic Levite priesthood to receive the "revelations of the Lord". At the dawn of the age of Kings, Samuel extended the use of the anointing oil to the Hebraic monarchs by anointing Saul (and later David) as "Messiah-king". These kings lead their people with the benefit of insights achieved through using the holy anointing oil to become "possessed with the spirit of the Lord." "Anointing was common among kings of Israel. It was the sign and symbol of royalty. The word 'Messiah' signifies the 'Anointed One', and none of the kings of Israel were styled the Messiah unless anointed. "1 The title was clearly only given to those "having the crown of God's unction upon them" (Leviticus 21:12). After the fall of the Jewish kingdoms, and the bloody purges following the forged discovery of the Book of theLaw (1 Kings 23), the cannabis holy oil was prohibited as associated with pagan worship. Yet it seems that certain sects retained the topical entheogen, and continued to practice the older religion, silently awaiting the return of a Messiah-king in the line of David. The ministry of Jesus marked the return of the Jewish Messiah-kings, and thus the re-emergence of the holy oil. Jesus was called the Christ because he violated the Old Testament taboo on the cannabis oil and distributed it freely for initiation rites and to heal the sick and wounded. Although there is some evidence of Jesus' use of this Judaic cannabis oil in the traditional New Testament, we get a clearer picture of its importance when we also look at surviving Gnostic documents. The term Gnostic, meaning "knowledge", refers to a variety of early Christian sects which had extremely different beliefs about both Jesus and his teachings than those which have come down to us through modern Christianity. Contrary to the depiction given in the New Testament gospels of Matthew and Luke, Jesus was likely not born as the Messiah. He received this title through his initiation by John the Baptist, and so it is not surprising that both Mark and John are conspicuously absent of the virgin-birth mythology, and begin their stories of Jesus' short career with his initiation by John. Although their version of Jesus' baptism by John describes it as involving submersion under water, the term "baptism" has connotations of "initiation", and Gnostic scriptures indicate that the original rite was performed in conjunction with the kaneh-bosm anointing rite, "the annointing taking place either before or after the baptismal ceremony. "3 Some Gnostic texts also specifically state that Jesus recieved the title Christ "because of the anointing,"4 not because of a water baptism. Conceivably, the washing off of the oil with water would have been a means to begin the termination of ritual and the oil's effects. It should be noted that the vision and words described were seen and heard only by Jesus, as it specifically states that "he saw". The role played by John the Baptist, as priest and prophet, is very similiar to that of the Old Testament prophet Samuel. Just as Samuel's annointing of Saul and David marked them as Messiah-king, so did Jesus' initiation by John make him the Christ. In the events after Jesus' vision and his overwhelmed recluse into the desert, there are clear parallels with the story of the prophet Samuel's initiation of Saul with the cannabis-rich holy ointment, and Saul's ensuing madness in the form of possession by the Spirit, and wandering off to make nabi (act in a frenzied ecstatic manner) (1 Samuel 10). The tale of Saul's possession by the spirit is an example of how the ancients interpreted the effects of cannabis and other entheogens. What we perceive as being "high" or "stoned" the ancients called "possessed by the Spirit of the Lord." The entheogenic effect of the cannabis annointing oil would have immensely magnified both Jesus' own expectations, and the ensuing experience with John. J The same proclamation is stated of the Anointed One, or King in Psalm 2: 7. In some authorative texts of the Gospel according to Luke, after the Baptism the voice of God declares, "This day I have begotten thee." J This indicates that the event of Jesus' encounter with John marks the true beginnings of Jesus' mission and his acknowledgement as the Messiah. The importance of the anointing, and Jesus' own acknowledgement of it, is again exemplified in the gospel of Luke. Unlike the shamanistic priests and kings of earlier generations, Jesus did not follow the strict Old Testament taboos that limited the holy cannabis oils use to Yahweh's chosen few (Exodus 30:33), but broke tradition and began to liberally use it in both healing and initiation rites. Through this open distribution the singular Christ, "the Anointed", was extended to become the plural term "Christians", that is, those who had been smeared or anointed. "By rubbing on this divine unction. . . obtained from certain special herbs or plants, they believed they were donning the panoply of God. "7 L A similar claim was made about hashish by the medieval Sufi poet Fuzuli, who recorded in his treatise Bang and Wine, the story of Basra, a disciple whose sheik felt that he had reached the ultimate degree of perfection through the consumption of hashish, and that he was no longer in need of further guidance. This story led to Fuzuli's proclamation that "hashish is the perfect being. . . for the seeker of the mystical experience." In many ways the Sufi movement can be seen as the phoenix which rose from the ashes of the earlier Gnostics. "Whatever the full ingredients of the Christian unction may have been, they would certainly have included the aromatic gums and spices of the traditional Israelite anointing oil: myrrh, aromatic cane,M cinnamon, and cassia. . . Under certain enclosed conditions a mixture of these substances rubbed on the skin could produce the kind of intoxicating belief in self-omniscience referred to in the New Testament. "8 N N This quote is from scholar John Allegro, whose work I drew from for this article. Allegro was a great scholar of both the bible and ancient languages, and his work broke a lot of ground. Allegro was also the only human secularist on the original team of scholars involved in the translation of the Dead Sea Scrolls, so he came to his views through more unbiased anthropological thinking than that of his more "faithful" co-researchers. In The Sacred Mushroom and the Cross, Allegro translated the kaneh-bosm reference in Exodus as "aromatic cane", and I have quoted him here on how the anointing oil "could produce a kind of intoxicating belief in self-omniscience." Yet Allegro failed to make the rightful connection with cannabis, seeing instead another plant drug at use, the amanita muscaria mushroom. His writings reveal he was extremely prejudiced against cannabis, even going so far with his etymological arguments as to suggest that the Greek term "kannabis" somehow referred to a mushroom. Allegro never smoked marijuana, but his own observations of what he referred to as "the 'pot'-smokers of today, the weary dotards who wander listlessly round our cities and universities," caused him to discount any possible use of cannabis as a means of achieving spiritual ecstasy. Being "anointed with unutterable anointing", the so-called "sealings" recorded in the Gnostic texts, can be seen as a very literal event. "There is water in water, there is fire in chrism." (Gospel of Philip). "go down into the water and come up without having received anything. . . The anointing (chrisma) is superior to baptism. For from the anointing we were called 'anointed ones' (Christians), not because of the baptism. And Christ also was [so] named because of the anointing, for the Father anointed the son, and the son anointed the apostles, and the apostles anointed us. [Therefore] he who has been anointed has the All. He has the resurrection, the light. . . the Holy Spirit. . . [If] one receives this unction, this person is no longer a Christian but a Christ." "might anoint them with the ointment. The ointment is the mercy of the Father. . . those whom he has anointed are the ones who have become perfect." Holy oil, given us for sanctification, hidden mystery in which the cross was shown us, you are the unfolder of the hidden parts. You are the humiliator of stubborn deeds. You are the one who shows the hidden treasures. You are the plant of kindness. Let your power come by this [unction]. The Gnostics had many levels of initiation, and the mysteries of these different grades were not written down like the more esoteric surviving texts were, but were given verbally at special ceremonies. Elements like the recipe of the obviously psychoactive holy oil were guarded with the closest secrecy, and were known only by the sect's most trusted initiates. This was a standard mystery school method, as "magic revealed is magic lost", and such secrets could only be entrusted to the group's most loyal members. We can add to Ireneaus's comments that the Gnostics likely wrote in such a concealing fashion to "baffle" their persecutors, like Ireneus, whom they feared would find out the source behind the secret power of their anointing oil. "...there are five trees for you in Paradise... Whoever becomes acquainted with them will not experience death." O The Gospel of Thomas has an estimated date of composition as early as 40-100 AD, and likely predates the earliest New Testament Gospel, Mark, which is thought to have been written around 60 AD. In the Gnostic view, "not experiencing death" meant reaching a certain state of interior purification or enlightenment, at which point the initiate would "rise from the dead" and "never grew old and became immortal." That is to say, he rose from ignorance and blindness, gained possession of the unbroken consciousness of his spiritual ego, and as such realized that he was a part of a larger Cosmic whole, which continued on long after the disappearance of the material body. Jesus referred to attaining this "higher" state of consciousness, as "entering the kingdom of heaven". As with the similar goal of yoga union, the "kingdom of heaven" state was not attained instantaneously, but required years of vigorous training. Like certain older branches of yoga, a variety of psychoactive plants were used as aids to facilitate the devotee in attaining this "higher" state. At the turn of the present century Professor GRS Mead summarized a German translation of a surviving Gnostic text, the "Second Book of Ieou". 16 P The text describes Jesus bidding male and female disciples to join him so that he can reveal to them the great mystery of the Treasure of Light. P One of the few that managed to survive the Catholic Church's editorial flames, without being hidden with the Nag Hamadi codexes. Jesus tells his followers that the master-mysteries of the Treasure of Light are involved with the mystery of the Five Trees, which may mean having knowledge of the magical plants that were used in the ceremony. Continuing with the ritual, Jesus gives the disciples cups, along with other articles, and seals their foreheads with a magical diagram. Then, like shamanistic and magical ceremonies the world over, he turns his disciples to the four corners of the world, with their feet together in an attitude of prayer, and then offers a prayer which is prefixed with an invocation, and continues with a number of purifications and into the Baptism of Fire. In this rite vine-branches are used; they are strewn with various materials of incense. The Eucharist is prepared...8 Q This offering of "fragrant-incense" to the Virgin of Light is reminiscent of the Old Testament offerings of kaneh-bosm incense to the Queen of Heaven (1 Kings 3:3). The Goddess played a paramount role in Gnostic theology. The prayer [this time, is to] the Virgin of Light. . . Q the judge; she it is who gives the Water of the Baptism of Fire. A wonder is asked for in "the fire of this fragrant incense", and it is brought about by the agency of Zorokothora.R What the nature of the wonder was, is not stated. Jesus baptizes the disciples, gives them of the eucharistic sacrifice, and seals their foreheads with the seal of the Virgin of Light. Next follows the Baptism of the Holy Spirit. In this rite both the wine-jars and vine-branches are used. A wonder again takes place, but is not further specified. After this we have the Mystery of Withdrawing the Evil of the Rulers, which consists of an elaborate incense-offering. R The title Zorokothora is likely derived from Zoroaster, an ancient Persian prophet-shaman. Centuries before the Christian age the Zoroastrian Magi were known for their use of "bhanga" (cannabis), as well as a primordial entheogenic drink known as "haoma" or "soma", now widely identified as anamita muscaria, or fly agaric mushroom. The Zoroastrians had a great influence on Jewish culture during the years of Persian rule. The concept of heaven and hell (conspicuously absent from the Old Testament) is derived from Zoroastrianism. Jesus' apparent knowledge of Zoroaster, and Zoroastrian sacraments, hints that perhaps amanita was identified with the entheogenic "wonder" filled "five trees" which Jesus used in his shamanistic initiation ceremonies. One of the more significant and widespread Gnostic sects, the Manicheans, were known to use anamita mushrooms, and worshipped Jesus right alongside Zoroaster. The Manicheans survived into the twelfth century in parts of Europe and China, and performed ceremonies similar to the one which Jesus is described as presiding over. The "wonder" in the incense which so perplexed Mead was presumably a reference to its undescribable psychoactive effects. It's also likely that the other undefined "wonder" indicates the magical properties of the different plants used in the ceremony. It would seem to follow that the identity of the different plants, vines, and berries described in the excerpts were identified to the participants as the Mystery of the Five Trees. At this time we can only speculate what other plants were used in the ceremony. The account of mandrake in Genesis 30: 14-16 and in Solomon's Song of Songs 7: 13, (which seems to indicate its addition to the holy anointing oil), clearly document the long term interest the Hebrews had with these seemingly magical plant angels. That the use and knowledge of such plants could have been passed down by certain "heretical" branches of the faith such as the Gnostics seems self evident. The addition of such a powerful hallucinatory drug such as mandrake (or belladonna, which was also popular in the Middle East at that time) would help to explain some of the extreme experiences related to the holy anointings and baptisms described in the Gnostic literature. A recent archeological dig in Bet Shemesh near Jerusalem has confirmed that cannabis medicine was in use in the area up until the fourth century. Thus it would seem to stand to reason that it was used for these purposes throughout the intervening Christian period. Archaeologists have found hard evidence that hashish was used as a medicine 1,600 years ago, the Israel Antiquities Authority said yesterday. Archaeologists uncovered organic remains of a substance containing hashish, grasses and fruit on the abdominal area of a teenage female's skeleton that dates back to the fourth century, the antiquities authority said in a statement. Anthropologist Joel Zias said that although researchers knew hashish had been used as a medicine, this is the first archeological evidence. (Associated Press 1992). Although the idea that Jesus and his disciples used a healing cannabis ointment may seem far-fetched at first, when weighed against the popular alternative (one that is held by millions of believers) that Jesus performed his healing miracles magically, through the power invested in him by the omnipotent Lord of the Universe, the case for ancient accounts of medicinal cannabis seems a far more likely explanation. Indeed, it was through the dawning of the Spirit, provided by the entheogenic and healing anointing oil, that the early followers of Jesus came to consider themselves Christians, or Anointed-Ones! Ironically, many modern day Christians zealously persecute marijuana culture, unaware that the name of their faith makes reference to a psychoactive topical ointment that was rich in cannabis. Bhang is a Sanskrit word, describing a strong boiled decoction made from marijuana, milk, sometimes olive oil, and spices. The evidence abounds for strong brews of various kinds, and, since the recipes varied, there is no certain way of knowing the ingredients of the various ancient brews. We just know, if the ancients are to be believed, that they got you ripped. As the Rg Veda of 1500 BC puts it: "This bull, heaven's head, Soma, when pressed, is escorted by masterly men into the vessels, he the all-knowing....thou sittest in the vessels, having been pressed for Indra, inebriating drink, which inebriates, supreme mainstay of heaven, who gazes in the far distance." Whether Soma was pressed from magic mushrooms, brewed from cannabis, opium or other herbs, no one can say for sure. Many of these brews describe themselves as powerful herbal combinations. The most famous of these bhang recipes appears in Exodus 30:22-30, describing the original holy anointing oil of the Israelites. The Hebrew 'kanehbosm' ('much kannabis') is an Indo-European word, often mistranslated, for obvious post-shamanic reasons, as 'calamus.' So, bear this in mind when making your OIL OF ABRAMELIN. Sumer was among the first of the ancient empires founded during this transition from the relatively placid Neolithic to the warlike Bronze Age. The Sumerian Mother Goddess was called Tiamat, ‘primeval waters.’ Her daughter, Iahu, was the Sumerian and Babylonian Spring Goddess, the original Persephone. This is the culture that gave birth to the Israelites. ‘Iahu,’ portrayed by the Sumerians as the Exalted Dove, literally means 'juice of fertility.' That is the name of an entheogen. The Sumerian Goddess was also called Inanna. 'Ishtar,' the later Akkadian-Babylonian name, is derived from the Sumerian ‘ushtar,’ 'uterus' in Latin. Iahu was the original Yahweh – her name is the root of the word. The Babylonian Odysseus, whose legend is the original basis of the Odyssey, was called Gilgamesh. The earliest representations we have of this ritual legend were carved on Sumerian stone, 3000 BC, and fragments of it were found in numerous sites, including Megiddo, Amarna and Khattusha, all dating to 1400 BC. The library of Ashurbanipal at Nineveh yielded the most complete version of the Gilgamesh epic, in fully deciphered Akkadian cuneiform, dating to 650 BC. Gilgamesh's quest is specifically shamanic. Gilgamesh slew the snake living at the base of the magical huluppu tree planted by Inanna, causing Lilith, the 'Screech Owl,' to tear down her house, in the midst of the tree, and flee. Having usurped Lilith's prophetic and transformative powers, Gilgamesh was enabled to present her tree to the all-powerful Goddess Inanna, who turned it into a shaman's drum and drumstick for Gilgamesh. But Gilgamesh plunged his ancient Sumerian city of Uruk into unending warfare, therefore, “because of the cries of the young maidens,” his drum and drumstick fell into the netherworld. Enkidu, the king's bold warrior, bravely descended to retrieve the shaman king’s drum, but was unable to return alive. Grief stricken, Gilgamesh then set out on his odyssey in search of the secret possessed by Utnapishtim, ‘Day of Life,’ the Ark-building Noah who had achieved immortality in the land of the magical fruit trees. On meeting the travelling Gilgamesh, the scorpion-man says to his wife, “The body of him who has come to us is flesh of the gods.” The scorpion man [above], about to share some scroll juice with the sacramental goat, was engraved on a Sumerian harp, 3000 BC. "'I will reveal a secret of the gods to you: a thorny plant that will prick your hands like a rose. But if you can get your hands on it, it will give you life anew! As soon as Gilgemesh heard this, he lit his water pipe, he tied heavy stones to his feet. The stones pulled him under to the bottom of the ocean, where he found the magical plant. He grabbed it, not minding the thorns. He cut the weights from his feet, so that the sea cast him up on the beach." That right! Gilgamesh got “stoned,” and this ancient text uses that phrase almost exactly the way we use it today! On the beach, Gilgamesh explains to his waiting boatman Urshanabi that the plant is so powerful that its name must be "Old Man Becomes Young." But on the way home, as Gilgamesh stopped to bathe at a well, a giant snake, alerted by the plant's magical aroma, arose from the depths and stole the plant of immortality. 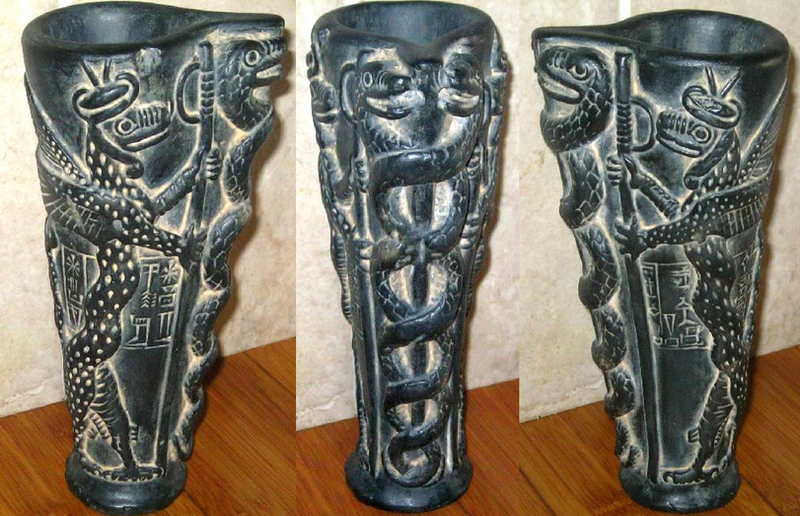 The plant-stealing snakes were carved onto a green stone vase used to hold the sacramental drink in one of Hammurabi's temples, 1700 BC. Like the scorpion men, their bite escorted Babylonians to the land of the magical fruit trees, there to visit Utnapishtim. We know, since we have the remains, that hemp was the basic ship rigging and netting of the ancient world. The greatest sea trading center from 1800 to 1200 BC was the Phoenician port city of Ugarit in North Syria, modern Ras Shamra, a metropolis that connected the island sea power Crete with mainland Greece, Cyprus, Egypt, Babylonia, Khatti (Turkey) and Assyria (Iraq). Syrian, Anatolian, Cretan and Cypriot kannabis, copper, tin, wine, grain, opium, olive oil, dyed wool, timber, rare stone, minerals, finished metal products and ships were traded for Babylonian, Egyptian, Somali and Ethiopian copper, gold, grain, wool, fabrics, incense, ivory, ebony, wine, beer, foodstuffs, medicines, jewelry and cosmetics. Crete, the greatest sea power of this era, was conquered, about 1500 BC, by the Mycenaeans of southern Greece, the legendary seafaring heroes of Homer’s Iliad and Odyssey. This is when ‘Gilgamesh’ became ‘Odysseus.’ The Mykenaikos were the people of the mykes, the ‘mushroom.’ Myesis, ‘initiation’ in Greek, mystes, ‘initiate,’ and mysteria, ‘the festival of the mysteries,’ all derive from the root of mykes. Mycenaean transports hauled kannabis, copper ingots, bronze weapons, fine stones, textiles, pottery, slaves, olive oil, wine, opium, and ‘unguent’ throughout the Mediterranean. Mycenaean pottery was renowned for its high artistic and technical quality. The Mycenaean stirrup jar, holding what the ancients called ‘unguent’ or ‘ointment,’ was Mycenae’s most popular export. Archeologists judge the commercial reach of Mycenae by the appearance of its distinctive unguent jars in the finds, from the Hazor sacked by Joshua to Akhenaten’s Tell el-Amarna to Hittite Khattusha. The ‘stirrups’ were handles for pouring out of the circular spout, which was small enough to be easily stoppered. One of the early full sentences Ventris was able to decipher in the proto-Greek known as Mycenaean Linear B was “How Alxoitas gave Thyestes the unguent-boiler spices for him to boil in the unguent.” On investigation, it was discovered that nothing inedible was ever used in the aromatic ‘unguent,’ and that some ingredients, such as wine and honey, were utterly inappropriate as a skin salve. That is, the ‘unguent’ was for ingestion. Kyphi, Egyptian incense, was also used as an aromatic and an interior medicine. Many herbs were listed as ingredients, the identifiable ones including coriander, cyperus, henna, ginger-grass, mint, iris root, wine, honey, olive oil and ‘MA.’ The long list, only part of which is decipherable, indicates that the herbal concoctions varied at the whim of the mixer. Cyperus can be three or four plants of the genus cyperaceae, including papyrus, eaten like sugar cane by the Egyptians, or chufa, brewed as an aromatic tea or eaten by the root. It has been found in Egyptian tombs dating to 2400 BC. Henna, the ancient red-orange hair dye, was used by the Egyptians to cure headache. Its flowers have a delicious aroma, and Egyptian ladies colored their breasts with it. The fine foxes below, shown imbibing amidst the floating fruit, were painted onto the walls of the tomb of Userhet at Thebes, 1300 BC. The last of the listed ointment ingredients, stressed by calling it ‘MA,’ ‘the Mother,’ is associated in the texts with Eileithyia, the Cretan/Greek Goddess of Childbirth, obviously an aspect of Demeter, ‘Earth Mother.’ The Mycenaeans made a point of importing herbal infusions from Crete, in stirrup jars with Cretan place names, marked with the sacred Double-Axe sign. Since they needed neither jars nor olive oil nor herbs for their large-scale unguent manufacturing process, and, since opium had always been a major Cretan crop, as the Cretan palace records show, it is likely that ‘MA,’ the ‘Mother’ ingredient, is mekonion, opium. The ‘ointment’ was distributed to all classes, including the army and the slaves, by the priests of the temples, as in Mesopotamia and Egypt. The workers building the Theban necropolis actually went on strike because “we have no ointment.” The infusion was frequently used for ritual purposes, and was also a warm gift of kings, palace to palace. Mycenaean ointment jars were found in the Hittite palace at Khattusha, near Ankara, which yielded hundreds of clay tablets in the various languages of their empire in Asia Minor. These included bilingual tablets in the two major languages, Luvian (SW Turkey) and Hittite. The Phaistos Disk, below, 1650 BC, is a circular six-inch Luvian syllabo-pictographic magic text made with stamp seals, in effect moveable type, found in a Cretan palace. Among the clear pictures are numerous different plants, an eight-petalled rosette, spotted mushrooms and doves. Professor Gordon translates a sentence from the Phaistos Disk as: "I have eaten in the temple of Hadd." Hadd is the Bull, Baal. One did not go into the temple to eat doughnuts, one went in to consume potent herbal sacraments, to commune with the ineffable. The Mycenaeans and the Welsh are related via the Tuatha de Danaan, the ‘People of the Goddess Danae,’ seafaring Mycenaean settlers of Denmark and Britain, 1500 BC. ‘Denmark’ is ‘the Kingdom of the Danaans.’ The eldest of the Danaid priestesses, Albina, ‘The White Goddess,’ gave her name to Albion, as Britain was called by the ancients. This is the same Druidic Albion that imported Egyptian beads from Akhenaten’s capitol city into Salisbury Plain, along with the Egyptian astronomical sophistication evident at Stonehenge. The floating mushrooms below were engraved on stone #53 by Stonehenge’s builders. The Rillaton gold cup, 1450 BC, taken from a chief’s grave in Cornwall, is virtually identical to the gold cups taken from the shaft graves at Mycenae in Greece. The Celtic Arianrhod was the Mycenaean/Cretan Ariadne. In The Song of Amergin, which Graves dates to the Greek invasion of Ireland, 1200 BC, Duir, the Oak-God, says “I am a god who sets the head afire with smoke.” The Celtic shamans wrote the Beth-Luis-Nion, the “Birch-Rowan-Ash,” the originary Welsh/Irish Tree Alphabet consisting of Birch-Rowan-Ash-Alder-Willow-Hawthorn-Oak-Holly-Hazel-Vine-Ivy-Dwarf Elder and Elder, plus five vowel trees. An interested monk, 1250 CE, preserved enough of the ancient Druidic Battle of the Trees, still recited by the bards, to enable O'Flaherty and Graves to rescue the ancient tree alphabet for modern times. Robert Graves: "I noticed almost at once that the consonants of this alphabet form a calendar of seasonal tree-magic, and that all the trees figure prominently in European folklore." ‘Oak’ is drys in Greek, derwen in Welsh, dur in Gaelic. The Gaelic plural duir, derwydd in Welsh, ‘Druid,’ means ‘oak-seer.’ Odysseus was a Druid: “The man himself had gone up to Dodona, to ask the spelling leaves of the old oak. what Zeus would have him do - how to return to Ithaka, after so many years - by stealth or openly.” In all Celtic languages, trees means letters; to cast a spell thus had pharmaco-shamanic as well as phonetic implications. The Druidic mysteries consisted largely of the correct use of the various berries, leaves, barks, saps and woods in the appropriate season. Graves’ decipherment of the tree alphabet is largely pharmaco-mythological analysis designed to determine which trees were substituted for which in the sometimes political process of transmission. The five vowels denote the five stations of the year: New Year’s Day plus the four 13-week seasons, which correspond to Birth, Initiation, Mating, Sleep and Death. The first vowel tree, Ailm, silver fir, was the tree of Druantia, the Gallic Fir-Goddess, ‘Queen of the Druids,’ whom the Greeks called Eileithyia. Theophrastus specifically says that the silver fir is Eileithyia. Druantia’s day was the first of the year, the extra day of the winter solstice, the day the Divine Child was born. It was celebrated by consuming Druantia’s offspring, the “seeds of a Pine,” as the Babylonians put it, that is, the Soma mushrooms, Amanita muscaria, that grow only in Pine forest. As the ninth wave of the sea. Odysseus found it very hard to overcome Kalypso’s seaborne powers. Troy, the fortress bottleneck through which the vast Black Sea trade emptied into the Aegean, fell to the Mycenaean war league, legendarily led by Odysseus and Agamemnon, in its twilight, about 1200 BC. Mycenae itself was destroyed less than a century later, as were the great Cretan centers the Mycenaeans had conquered, probably by the Dorians and their northern allies, the founders of classical Greece. The Hymn To Demeter, written down 700 BC, is the foundation legend of Athenian culture, as the legend of Moses on the Mountain is the founding legend of Israeli culture. Classical writers and the Hymn itself attribute the origin of the Great Mysteries at Eleusis, 14 miles from Athens, to Crete. Eleusis means ‘the place of happy arrival,’ ‘Advent,’ and is related to Elysion, ‘the realm of the blessed.’ The name derives from the Cretan Goddess of Childbirth, Eileithyia, also called Eleuthyia. The name itself is not Indo-European, but Old European, Cretan or Carian, related to lada, ‘lady’ and the goddess Leto. These late patriarchal renditions often turn ‘mothers’ into ‘daughters,’ as with Hecate, but, obviously, were quite uninhibited about preserving Hecate’s overt herbal shamanism. The root of narkissos, the fragrant ‘narcissus’ of a hundred blooms that ensnared Persephone, is narki, ‘drowsiness,’ likewise the root of narkotikos, ‘narcotic.’ ‘Ivy’ is kissos. According to Ovid, the ‘narcotic ivy’ was opium. Persephone’s mother, Demeter, was the Opium Goddess every bit as much as the Grain Goddess. On the spectacular gold signet ring from Mycenae, above, 1500 BC, Demeter, seated beneath the Double Axe and the World Tree, hands three bulging poppy heads to Perse. On a gold signet ring from the Thisbe Treasure, a standing Persephone hands two bulging poppy heads to a majestically seated Demeter. The Cretan 'sleeping idol,' Demeter, from Isopata, wears a diadem of opium poppy heads, each painted with a slit for extraction of the sap. A sacramental vase in the National Archeological Museum of Taranto, below, 450 BC, depicts Demeter's son, Dionysos, wearing a crown of opium poppies, approvingly watching his maenad dance ecstaticaly beneath her magical herb carrier, called a thyrsos. The picture is a comment on the shamanic function of the vase’s contents. A beautiful ceremonial vase, below, 350 BC, shows the divinites adoring a huge poppy seed capsule growing out of the center of an ornate temple-tomb, surrounded by floating four-petal rosettes, symbol of the four-petalled opium flower. Persephone rushes up to the enshrined poppy, a huge speckled mushroom, unmistakably the unique Amanita, the size of a parasol, in her right hand. These too are references to the shamanic contents of the vase. Cannabis and opium, as well as magic mushrooms, are likely ingredients of the sacred kykeon ('mixture') drunk at Eleusis. As The Bhagavadgita put it: "There is a fig tree, In ancient story, The giant Ashvattha, The everlasting, Rooted in heaven, Its branches earthward; Each of its leaves, Is a song of the Vedas, And he who knows it, Knows all the Vedas." As Revelation puts it: "On either side of the river stood a tree of life, which yields twelve crops of fruit, one for each month of the year. The leaves of the trees are for the healing of the nations." This was, as Acts admits, the exact opposite of the teaching of the real Joshua (‘Jah Saves’), executed by the Romans for militarily resisting their enslavement of Israel. But Paul, with the sword of Rome behind him, won his argument with “the Jews,” as the survival of the propagandistic Greek mistranslations of the original Hebrew New Testament prove. Joshua, after his execution, was turned into the official Roman lamb-idol, the Pauline “Jesus,” a Roman name no one ever called him during his lifetime. The Hebrew writings of the real Apostles, Israeli revolutionaries, were systematically burned. Joshua was no lamb, and conformity to Imperial authority was not his highest value. Nor were the sacraments he was talking about symbolic wafers. Israel had been conquered by Alexander the Great 300 years earlier, and was, culturally, almost as Greek as it was Hebrew and Aramaic. It was Alexander's Greek empire that Rome conquered. Iasius, to use his real Greek name, the ‘Healer’ (cognate with Iahu and iatros, physician), was the pharmakos who was the pharmakon. Israel’s Hebrew and Greek speaking mystics, called ‘Essenes’ by the Romans, called themselves the Iassai, the ‘Jesuses.’ They wrote the Qumran Dead Sea Scrolls. John the Baptist was raised in this community. Here is the genuine article, preserved by an archeological miracle, one of the Qumran Thanksgiving Hymns of the Iassai, written in Hebrew in 50 BC. Part of the reason for their survival is that the scrolls were penned on sheep or calf skins, rather than the usual papyrus linen. This indicates their canonical character, as does the superb penmanship of these accomplished scribes. The other reason for the survival of the Dead Sea Scrolls is, oddly enough, the Roman attempt to destroy them. This scroll was buried under sand for nearly 2,000 years after the Romans, in 68 CE, entombed it by sacking and burning the Essene desert community of Qumran near the Dead Sea. "For Thou didst set a plantation of cypress, pine and cedar for Thy glory, trees of life beside a mysterious fountain hidden among the trees by the water, and they put out a shoot of the everlasting Plant. But before they did so, they took root and sent out their shoots to the watercourse that its stem might be open to the living waters and be one with the everlasting spring....And the bud of the shoot of holiness for the Plant of Truth was hidden and was not esteemed; and being unperceived, its mystery was sealed. Thou didst hedge its fruit, O God, with the mystery of mighty Heroes and of spirits and holiness and of the whirling flame of fire. No man shall approach the well-spring of life or drink the waters of holiness with the everlasting trees, or bear fruit with the Plant of heaven, who seeing has not discerned, and considering has not believed in the fountain of life, who has turned his hand against the everlasting bud." Extinction can lead a society to paranoid views of life and death. Sumerians did not have a concept of life after death, but rather thought of death as limbonic circumstance and place of no return. The magical ideals of Sumer differed from elder cultures' reincarnation theories. As result in contrast, Sumerian magic was empowered as a corporeal flume for belief rather than survival mechanism of spirituality. These concepts were later absorbed by Akkadian, Assyrian and Semitic peoples. Sumerian magic would go on to shape and represent all Babylonian magic. "The belief in resurrection was so well suited to the Mesopotamian view of life, that the wonder would be, not that they should have conceived of it, but rather that they should not. For to them, more than any other people of antiquity, this belief lay ready to hand. They saw the sun rise and set from day to day, and to them it was a mystery requiring explanation. They pondered over it and found its place in their mythology and religion. They saw the passage of the sun from the summer to the winter solstice and back again, year after year; the cycle of the moon's phases; and venus disappear as the evening star only to reappear as the morning star. All these changes represented to them the life and death of the gods, and their restoration to life. It would be strange indeed if the Mesopotamians, with such a lively conception of the return to life of the gods above them, and the animals and plants below, never asked themselves, "will not man too sometimes come forth from the underworld?" Let us found a shrine, a sanctuary there. His face lit up greatly, like daylight. Create Babylon, whose construction you requested! For a whole year they made bricks for it. They had built a high ziggurat for the Apsu. They founded a dwelling for Anu, Ellil, and Ea likewise. And his horns' look down at the base of Esharra. The three hundred Igigi of heaven and the Anunnaki of the Apsu assembled. All Rights Reserved for Original Multimedia, Graphic & Written Content. Materials mirrored here under "Fair Use" for Educational Purposes Only.